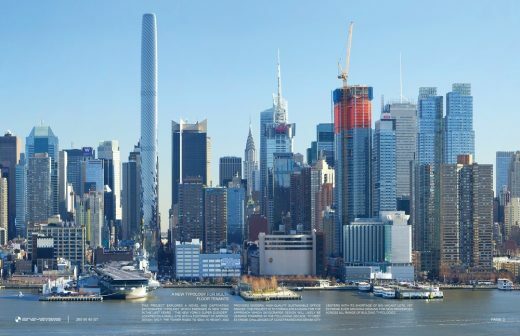 The project explores a novel and captivating tower typology which emerged in New York in the last years — “The New York’s Super Slender”. Located on a small, currently vacant site on West 45th St which footprint measures at approx. 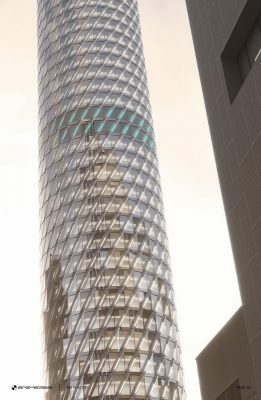 30x30m only, the tower rises to 400 m in height, and provides modern, ergonomic, sustainable office spaces for multi-floor corporate tenants. 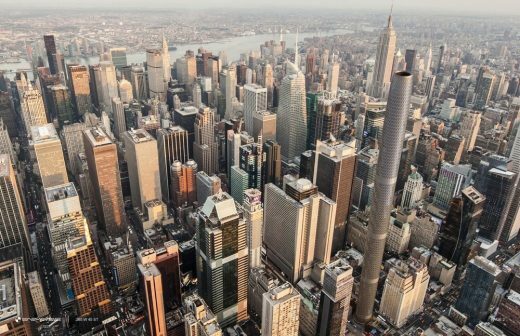 The project is another take on a path which skyscraper design will likely be following in the coming years, to meet extreme challenges of constrained and dense city centers, with their shortage of big vacant lots, yet ever-growing demand for new properties. 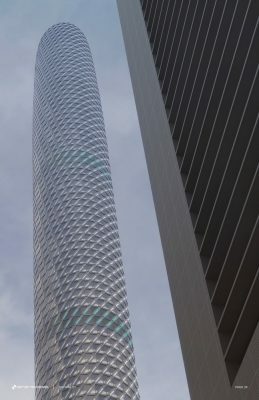 The tower utilizes an innovative structural system, which solely determines its appearance. 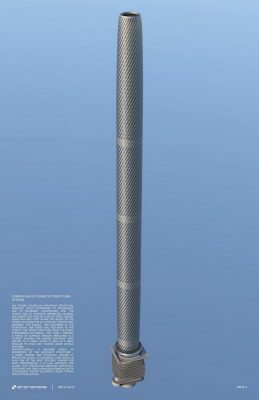 Due to extremely constrained site, the choice was to eliminate perimeter columns and substitute them by a set of steel cables, which run and twist along the height of the tower, allowing for an ultralight, yet sturdy structural assembly. The cables are anchored in a deep foundation, MEP zones and tied back to the core at the upper structural ring. The spiral arrangement of the cables—the “twist”—creates a force of surface tension, resulting in a “corset” holding the insides contained, very similar to a candy which is held inside a wrap because its ends are twisted (more details in the images’ captions). 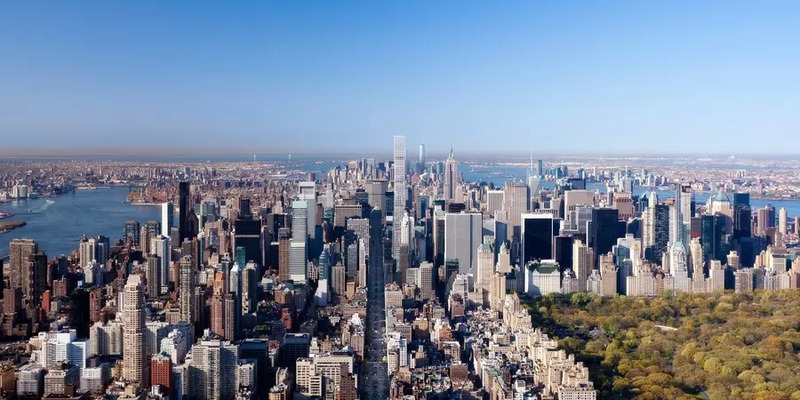 Architecturally, it becomes simply an expression of the building’s structure— a sleek, minimal and futuristic volume of reflective glass, a cylindrical tube which is also one of the most efficient shapes for wind resistance. It is also abstract, and aligns with technology-oriented aesthetics. Solutions like circulating elevators and multi-story lobby with automatic visitors’ dispatch systems connected to their mobile devices allow to accommodate higher occupancy rates typical for office buildings. 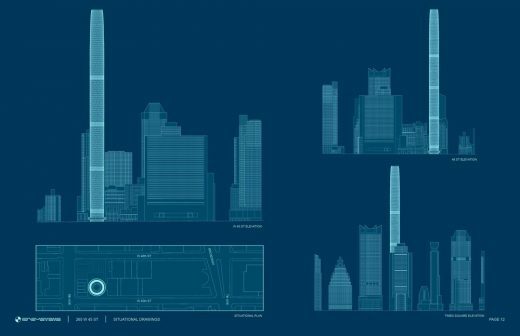 The goal was to design the block’s centerpiece which by its alien-like appearance would contribute to the extremely diverse, charging, energetic and ever-progressing built environment of New York. 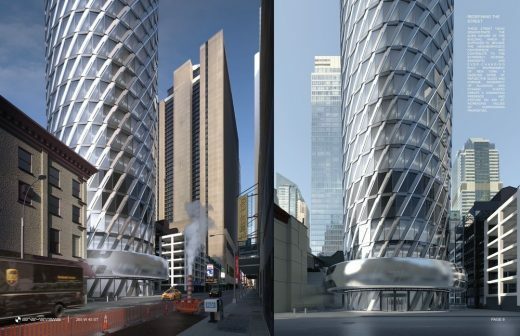 A dazzling shine of reflective glass and chrome, modernity of aluminum, and dynamic shapes are called to create a dominating presence and stature on 45th St, increasing values of surrounding properties. One of the most distinctive features of the design is the “Halo” canopy—a toroid volume soaring above the entrance plaza. 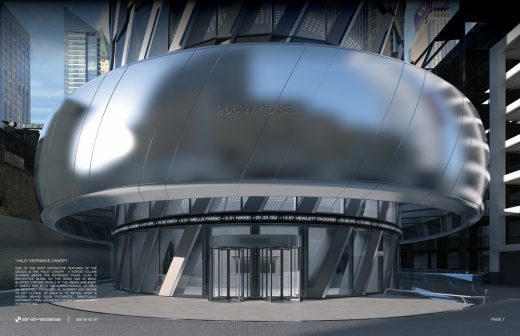 Clad in reflective glass on the sides and in bead-blasted chrome panels at the front and back, it subtly reflects the surroundings, as well as definitely provokes an interest and desire to get closer, to walk in, to reveal what is hidden behind such futuristic, drastically different form, unlike any other tower canopy in Manhattan. With a common visual characteristic and shared materials and design features, these two spaces are though different and each captivating in its own respect. 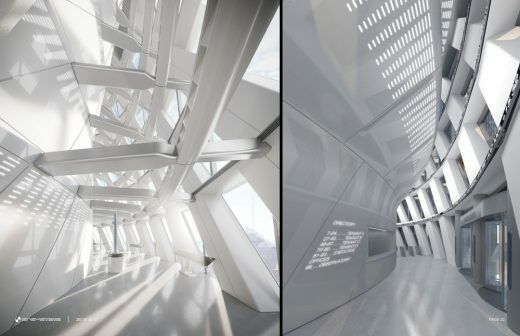 The entrance lobby, which greets a visitor with an austere multi-story space, is a first glimpse into very modern, technology-driven interiors of the tower. 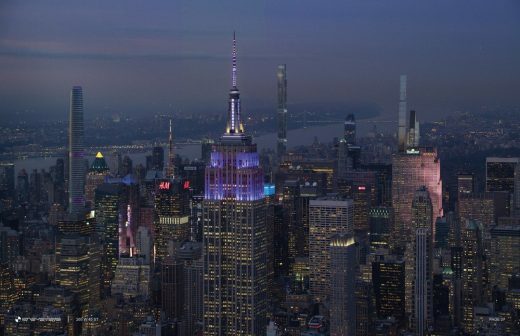 Surrounded by the dark canyon of Midtown, it still relies heavily on artificial lighting, yet already perceives as a gateway into bright and light-filled spaces of the offices and beyond, as the tower rises into the sky to leave behind the noise, smoke and fuss of what we so lovely call “The Capital of the World”. In double-deck elevators, visitors reach the vantage point—an observation deck at level 96, which provides 360-degree unobstructed views of the city and allows to rest and meditate in serene and light-filled space. 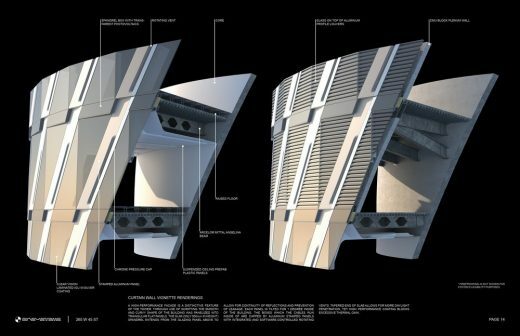 A distinctive feature of the tower, it was scripted in parametric software to wrap the smooth and curvilinear shape of the building, and panelize it into flat panels comprised of paired triangles. The slim (only 500 mm in height) spandrel extends from the glazing panel above to allow for continuity of glass reflections and prevention of leakage. Each panel is tilted for 1 degree towards the inside of the building. 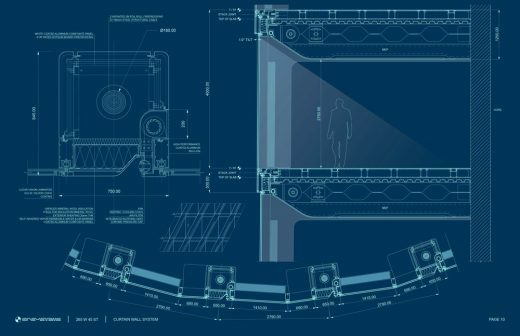 The boxes which the cables run inside of are capped by aluminum stamped panels with integrated and software-controlled rotating vents for natural ventilation/conditioning. Tapered ends of slab allow for more daylight penetration, yet high-performance glass coating blocks excessive thermal gain. 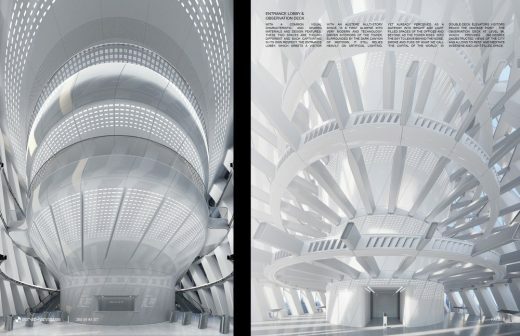 As part of the tower’s integrated design approach, the furniture was also engineered to fit the space precisely. Due to the recently formulated risks which prolonged seating poses on health of modern workers, it is crucial to equip the space with ergonomic, sit-stand transformable furniture. 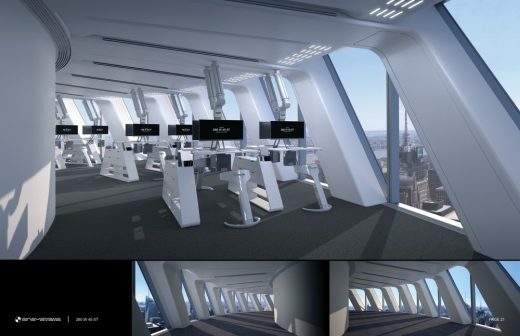 The desks are hanging from the ceiling on gas-lift arms which allow for an easy individual adjustment of their height and rotation/position, as well as quick office layout/seats quantity reconfiguration based on minute needs of a tenant. Digital communication systems and video conference equipment allow a multi-floor tenant to cooperate effectively, freeing the staff from frequent travels between the floors. 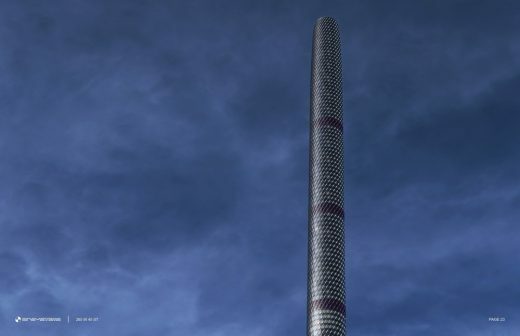 Due to extremely dense spatial arrangement of the tower, a solution for locating a multi-ton tuned mass damper had to be non-trivial. 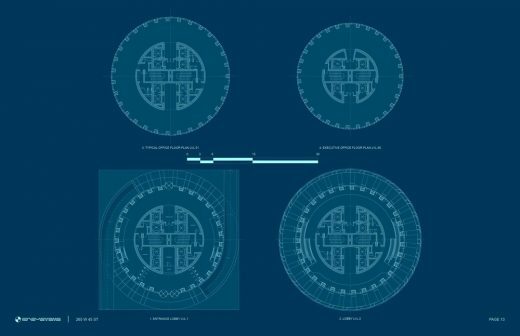 The idea was to design a toroidal damper, which will not take up space directly on top of the core, to leave it free to locate elevator overruns and to provide continuity of evacuation paths such as stairs inside the core. Thus, the damper circles the core with even distribution of mass, and is software controlled to counteract sways caused by high-velocity winds. 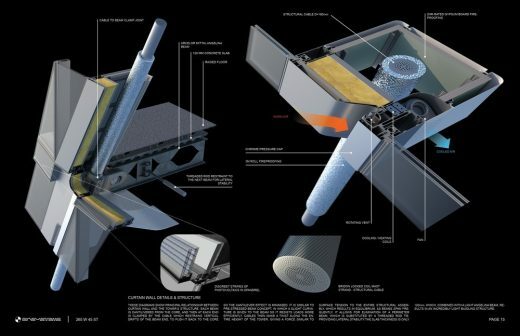 RB Systems, founded in 2016 by Rustem Baishev, has its design methods rooted in aggressive application of technology, and reimagines architecture as rather a field of systems engineering, than a field of art. 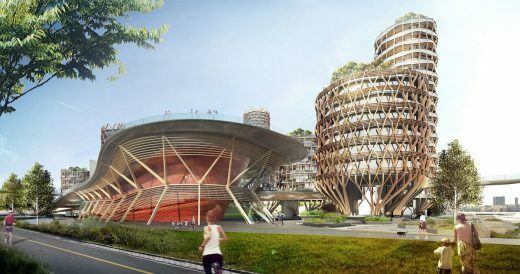 By designing buildings into moving, high-performing machines, which produce and save energy, interact with wind, provide more daylight, save materials, utilize innovative structural concepts and evolve into new typologies, they aim at resolving the challenges of built environment of today and believe in architecture’s ability to change the world for the better. 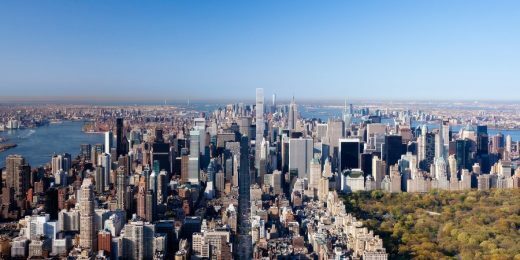 Since its inception, the firm’s projects were recognized and featured by various organizations and award programs including NASA, Space X, Architizer A+Awards, AAP, American Society of Civil Engineers and others.